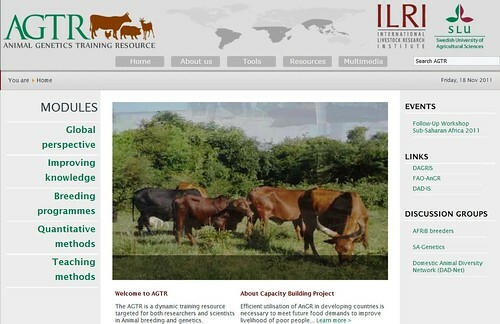 This entry was posted in Animal Breeding, Biodiversity, Biotech, Breeds, ILRI, Indigenous Breeds, Launch, Livestock and tagged AGTR by ILRIComms. Bookmark the permalink. I was relieved to see this document while surfing the net. Am a mid-career female animal scientists (lecturer II)in the University of Nigeria, Nsukka. Am so eager for practical training and exposure to improved animal breeding genetic technologies TO build my capacity to use modern molecular methods and bio-informatics to characterize and use the available genetic advantages in indigenous livestock, enabling optimum management of this natural resource. I would appreciate opportunity to join a group/ organization that will enable to realize my dream of becoming a seasoned and well-informed Nigerian poultry breeder. Please, assist me as much as you can. I am an animal breeder working in India on AnGR. I want to attend the training and want to know how I may proceed. i am an apiculture and animal production researcher working at research institute of agriculture in Ethiopia. And i went to attend this training that helps me on contribution of research outputs to my countries development. please assist me as much as you can.